Love the location. Price was reasonable. Staff was very helpful. Where to find Knoxville hotels near an airport? How can I find hotels in different Knoxville neighborhoods? Where can I find hotels in Knoxville that are near tourist attractions? 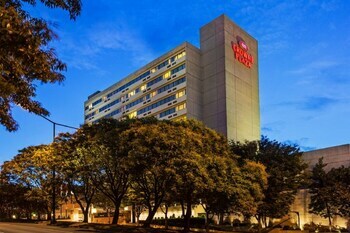 Visitors can discover a broad selection of accommodation options in Knoxville. Spend some time exploring our 32 hotel listings, which are all within a 0.1-kilometre (0.1-mile) radius of Knoxville's center. 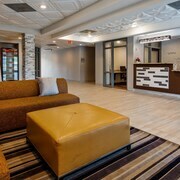 A key to hassle-free traveling is convenience, so be sure to take a look at the Four Points by Sheraton Knoxville Cumberland House Hotel and Hilton Knoxville, which can be found within 1 kilometre (0.6 miles) of downtown Knoxville. 16 kilometres (10 miles) from downtown Knoxville is the hotel-rich neighborhood of West Knoxville. It offers 39 accommodation options. Some good places to stay in West Knoxville include the Homewood Suites by Hilton Knoxville West and Hilton Garden Inn Knoxville West/Cedar Bluff. Tourists will also find some comfortable establishments in North Knoxville. This hotel neighborhood is 6 kilometres (4 miles) from downtown. Some of the better known North Knoxville places to stay include the Hampton Inn & Suites-Knoxville / North I-75 and Comfort Suites North. The Women's Basketball Hall of Fame and Sunsphere Tower are well-known Knoxville, attractions, and many visitors choose to stay nearby. The Knoxville Marriott and the Crowne Plaza Hotel Knoxville Downtown University are some of the options that are close to the Women's Basketball Hall of Fame. 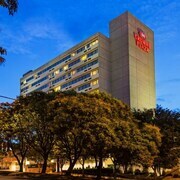 The Holiday Inn Knoxville Downtown and the Hilton Garden Inn Knoxville/University are close to Sunsphere Tower. The Inn of Knoxville and Cook Loft are recommended options if you plan on visiting Mabry Hazen House while you are in Knoxville and want to stay nearby. The Butterfly Gap Retreat is 30 kilometres (19 miles) away from the main part of Knoxville. Another option is the SpringHill Suites by Marriott Knoxville at Turkey Creek, which is situated 20 kilometres (12 miles) away. 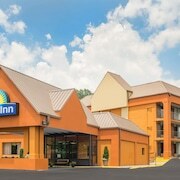 Other hotel and apartment options in this area are the Hampton Inn and Suites Knoxville -Turkey Creek/Farragut and the Embassy Suites Knoxville West. After you have enjoyed Knoxville, take a little time to explore the other cultural and scenic attractions of the Eastern Tennessee area. Investigate Eastern Tennessee's historic mansions and history museums. Outdoorsy types could also take the time to to admire the region's mountains and rolling hills. In this part of United States of America, visitors might also enjoy mountain biking, hiking and zip-lining. Kodak is 25 kilometres (16 miles) to the east of Knoxville, and is where you'll find the River Islands Golf Club and Adrenaline Park. Some of our recommended Kodak accommodation options are the Hampton Inn & Suites Sevierville at Stadium Drive and Holiday Inn Express Hotel & Suites Kodak East - Sevierville. 35 kilometres (22 miles) to the south of Knoxville is Townsend Visitor Center, home to the Best Western Cades Cove Inn and Dancing Bear Lodge. Regardless of whether you're passing through or spending a few nights in Townsend Visitor Center, be sure to visit Tuckaleechee Caverns and Upper Tremont Road. McGhee Tyson Airport can be found 19 kilometres (12 miles) away from Knoxville. 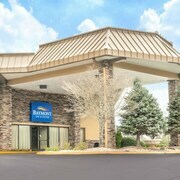 If you wish to stay nearby, you can book a room at the Hilton Knoxville Airport or the Courtyard Marriott Knox Airport. What are the most popular Knoxville hotels? Are there hotels in other cities near Knoxville? What other types of accommodations are available in Knoxville? Explore Knoxville with Expedia.ca’s Travel Guides to find the best flights, cars, holiday packages and more!